Santa has been very kind to me last Christmas. Amongst other wonderful presents I got a madeleine baking tray. I being myself had to test it as soon as possible, regardless of any new year’s diet resolutions (not that I ever stick to any). 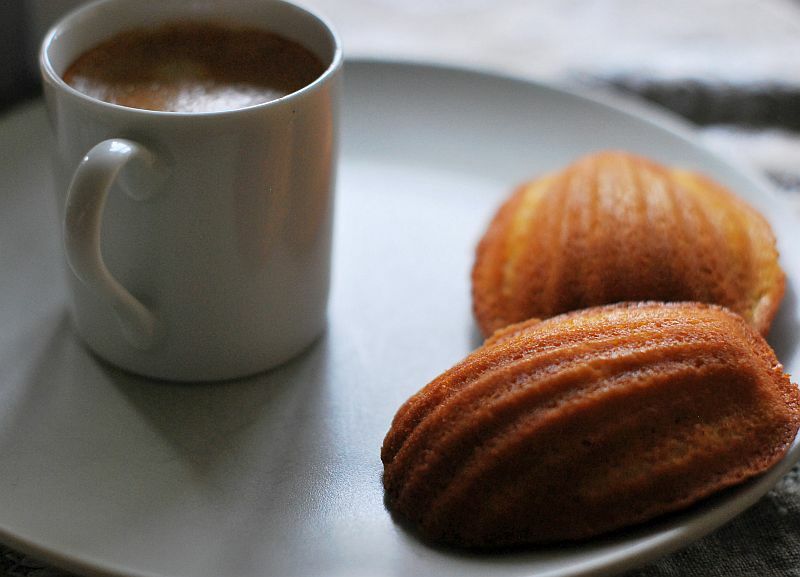 Madeleines are small sponge cakes traditional from the Lorraine region in France. They are great for sharing at parties or as part of the afternoon tea display. Traditionally they are made with Genoise batter but I also introduced self raising flour for more consistent results. Apart from the traditional baking tray with shell shaped depressions you don’t need any other specialist equipment to make them. 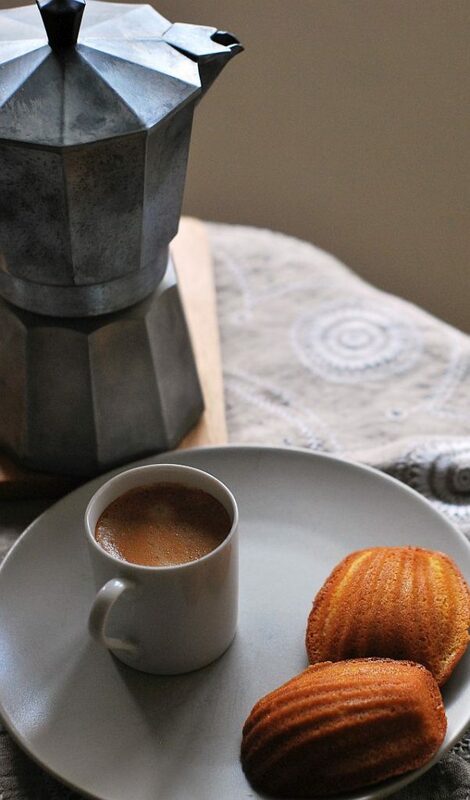 You can get the madeleines baking tray in any decent kitchen equipment store or on line. I flavour my cakes with lemon but orange or coconut will work perfectly as well. Melt the butter in a small sauce pan over a low to medium heat and cook to a buerre noisette (wait until the milk solids separate and drop to the bottom of the pan, then continue cooking until they change colour to a golden brown). Remove from the heat. Break the eggs into a large bowl, add the sugar, honey, lemon zest and whisk together with a hand-held electric whisk until pale and thick. The mixture should just leave a ribbon trail when you lift the whisk. Add the flour to the butter slowly, beating with a wooden spoon to incorporate fully. Place the pan over a low heat and cook, stirring, for 1 minute, then remove from the heat and set aside to cool slightly. Stir the buerre noisette and flour mixture into the whisked eggs and place in the fridge for 45 – 60 minutes to firm up. Meanwhile pre heat the oven to 200 centigrade. 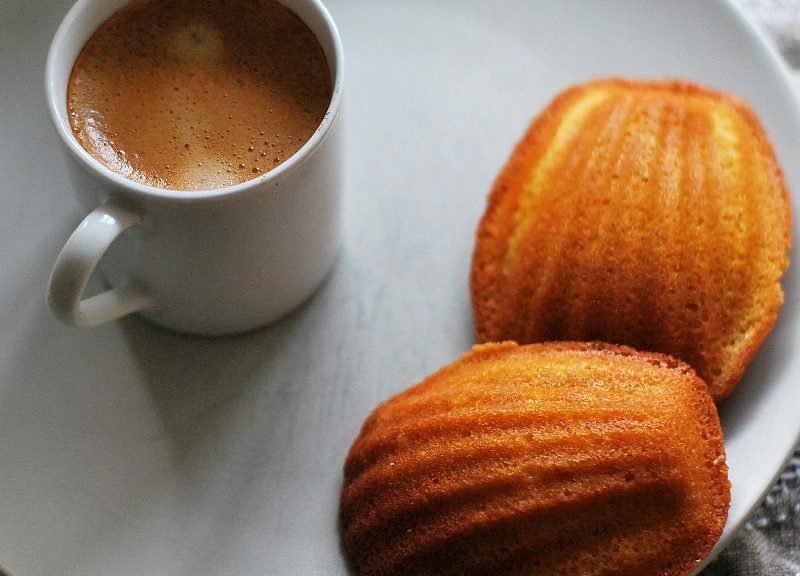 Grease the baking tray with the extra butter and place a level tablespoon of the mixture in each madeleine mould. Bake in the middle of pre heated oven for about 8 minutes until risen and golden with a ‘humped’ middle. 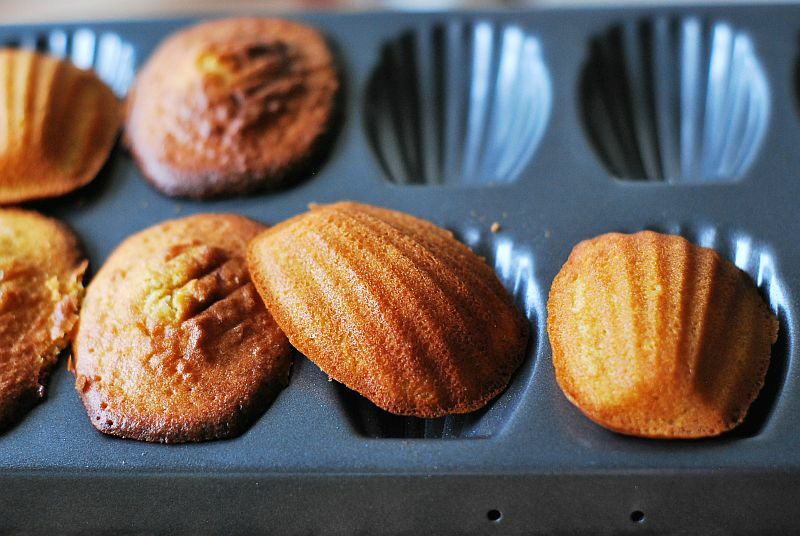 Remove the madeleines from the moulds to a wire rack to cool and repeat with the remaining mixture for a second batch if necessary. They are best eaten the day they are made, but will keep in an airtight container for a few days.